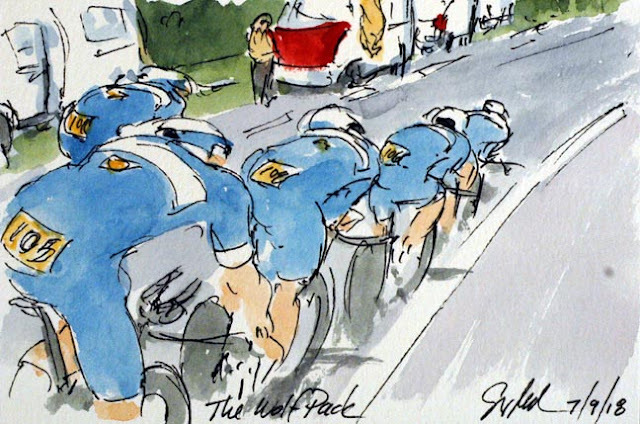 The self proclaimed wolf pack road hard today with hopes of putting Philippe Gilbert into the Maillot Jaune. As they went through the second time check, the pack had shed a few members. Julian Alaphilippe slides off the front to slot back in behind Bob Jungels. Ahead of him were Niki Terpstra, Yves Lampaert, all being lead by Gilbert. Apparently he was truly hoping for yellow. Alas, they didn't quite get the ride were hoping for, taking third on the stage. But it does leave Alaphilippe and Gilbert high up on GC. It is entertaining to see all of the caravans lining the course holding fans that follow the Tour around France.